An adjustable ring that easily fits ring sizes 6-8. Available in sterling silver or as shown in 14k gold filled. Made with natural tourmaline baguette and round cabochon. A 14k gold ring with faceted natural precious gemstones. Shown with Diamonds. Each gemstone is approximately 2mm. Two tiny frogs are holding a natural white pearl in this 14k gold ring. A 14k yellow gold adjustable snake ring. Oxidized and polished to bring out the fine details. Adjusts from size 5 - 8. A 14k gold ring with a small faceted gemstone. Approx. 1/2" W with a 3mm gemstone. Approx. 1/2" W with a 3mm faceted stone. 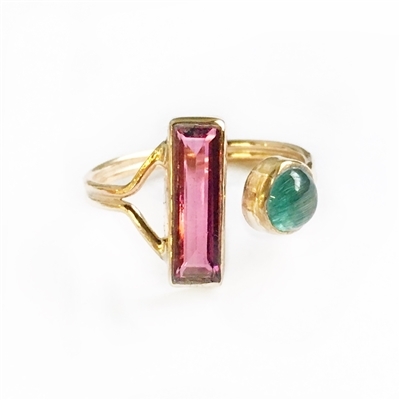 An Art Deco style 14k gold ring with a faceted gemstone. Approx. 1/2" W with a 5mm faceted stone. *Please contact us for availability with ruby, sapphire, tanzanite, white topaz and more special order gemstones. A 14k yellow gold vintage style heron ring. Oxidized and polished to bring out the fine details in the wings. A 14k yellow gold vintage style filigree band. Oxidized and polished to bring out the filigree details. A 14k gold vintage style ring of two herons joined to infinity. Oxidized and polished to bring out the fine details in the wings.